A long time ago in the wild north-west of Australia a prospector stumbled across a seam of one of the world’s rarest minerals, blue asbestos. He pegged a claim, dug a mine, and began a rush that would lead to the building of a boom town out in the desert, a place called Wittenoom. Sixty years later that town is dead, and so are many of the men, women and children who lived and worked there. Doctors expect that eventually 2000 people will die or be disabled because of their exposure to the deadly dust of Wittenoom. It is the world’s greatest industrial disaster – and it could all have been prevented. Long-hidden documents prove that the men who ran that mine, one of Australia’s largest public companies, were aware from the start of the terrible dangers of blue asbestos. They did too little, too late, to protect their workers, as did the government which should have been the watchdog. It was a conspiracy of silence. 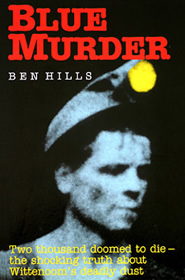 Blue Murder tells the story of the mine, the migrants who were press-ganged into working there, the warnings that were ignored, the export of Australian blue asbestos all over the world. And it documents the long fight for justice for the Wittenoom survivors, a fight which is still not over. Blue Murder was published in 1989 by Sun Books, a division of Pan Macmillan Australia.